A family gathering is very sensitive to handle because it's not an ordinary friend gathering where you can do whatever you want or anything you feel easy to do. If you are participating in the family gathering you should be decent whether you are talking, eating or drinking – I am not a fan of being quiet in the family gathering but you should be aware of what you are talking or doing. A family gathering is a time when you are supposed to know something about your family members e.g, what they eat, what they like to talk, what are their likes and dislikes and everything that is crucial to know about your family. A family gathering is a time when some of your old uncle and aunts try to observe you and judge your body language so, that's the time when you have to look decent and avoid those gestures or talks that are against the rules of family gathering. So, you have to avoid these 5 things at family gathering otherwise, you will be scolded by your father or mother badly. Gaseous exchange in the human body is very important but, when you are in a family gathering this behavior is barbarous and full of shame for you and for your family. If you are feeling something in your stomach while dining or watching movie you should excuse for going to toilet or going outside instead of expelling that bad smell gas to ruin the taste of the food or movie or whatever you are doing – in some cases of girls or boys sensitive to bad smell, disgusting gas smell can cause an instant vomiting – go get yourself outside, empty your bloated gaseous belly before someone else request or urges you to go outside to let them breathe healthy air instead of bad smelled gas. Having fun is a part of the family gathering, without laughing and joking gathering is vapid and colorless but, laughing and joking also has some limitations to be kept in mind, if you cross those limits you could possibly be kicked out of the room or get scolded. If you think yourself or laugh in front of the mirror like you did laugh in the family gathering before – you will feel like I am the most disgusting and insane man in the whole world. If you keep on like this your conversation will be weightless as everybody thinks you are a mad person who laughs out loud for nothing. Keep an eye on your limitations before doing anything in front of your family. Burping in public, office or house is a very shameful act that could harm your personality. If you are burping in the office or in the meeting you could get rusticated or receive tons of hate from your senior or boss but, in family gathering burping loudly tells a different story. 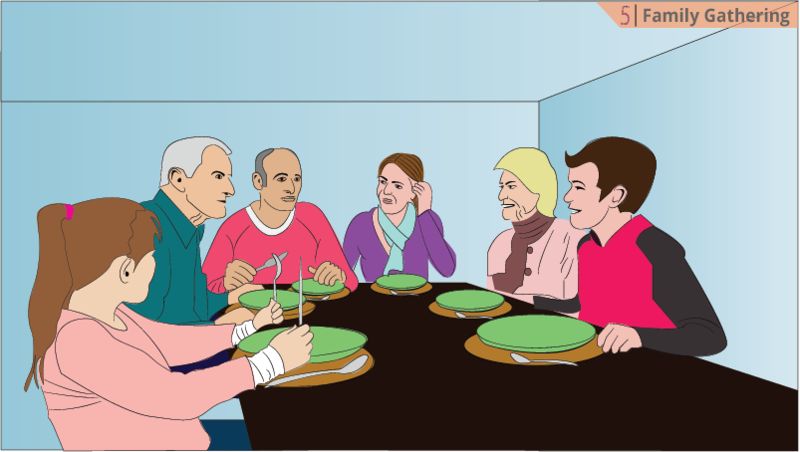 While eating or drinking every person burp but burping out loud on the dining table is against morality and considered as shame in some countries – when you burp out loud in family gathering everybody will notice this act of shame and keep quiet but after dinner or lunch, the teachings of your parents will be discussed on your back. Burp quietly if you were burping loud before, it really hurts when someone in your family talks about this or notifies you about that. If you don't know how to burp quietly get you self a lesson from your elders. Friends are frank with each other and being a little abusive in friends is normal. Abusing and chiding each other is a common thing in friends and class fellows but, there is a great difference between friend gathering and family gathering as I told you before you should obey and take care of all limitations that are in between every son and father, mother and daughter and family members. Talking less is the key to be getting caught by the eyes of your family members but if your tongue starts conversation with an abusive word everybody will be afraid of talking with you, they will ignore you because of your abusive language so, the conclusion is to do whatever you want in friends gathering but be clean while talking with your relatives in family gatherings. The purpose of the family gathering is to spend some time with your family if you will stick yourself in mobile phone or tablet without even noticing what's happening between your family members. Playing with mobile during the family talk is pathetic you should avoid this and give some time to your family to understand you to teach you how you can take a good decision in your life. If you will give time to your family you would get the attention of your family to become a beloved person.The conclusion is to avoid using the mobile phone in the family gathering.